With all this talk of people installing Mac OS X, Windows XP, and even Windows Vista on the Eee PC, I figured I had to get in on some of this alternate OS action. 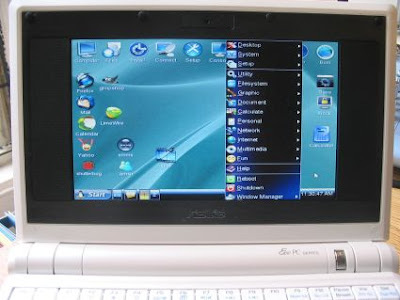 But I don’t have a USB DVD drive, and more importantly, I don’t really want to mess with the Xandros operating system that comes with the Eee PC, which for the most part I love. So I decided to give my Eee some puppy love. Puppy Linux, that is. Puppy is a tiny Linux distribution that fits on a flash drive, and can be booted from a flash drive. It’s sort of like a LiveCD, in that you can run it from any PC without writing anything to the PC’s hard drive. But since you’re running the OS off of flash memory and not a CD, you can save data. In my opinion it’s way better then OLPC project since it has more system power. Have you seen this video review made by The Dallas Morning News? This is useful for users who purchased the eee with Windows XP, but want to try Linux, or for Linux users who want to maximize storage by using all of 4 GB disk space in the eee for data. NB: The microphone and web cam of the eee are not yet operational for this version of breeezy.